The BC Lions made a trade, took a gamble and got their wish list at the Canadian Draft, Sunday. 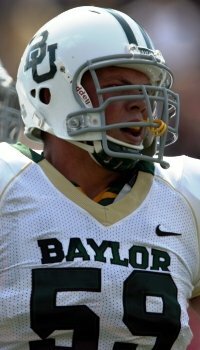 While conventional thinking had the Lions taking Bishop’s receiver Shawn Gore with the fourth overall pick, they instead chose highly touted offensive lineman Danny Watkins of Baylor University. The native of Kelowna will play out his NCAA eligibility this year before potentially arriving at the Lions 2011 camp. Then, by the time the 10th overall pick rolled around, Gore was still available. The Lions selected the Bishop’s grad in what Wally Buono described as triumph of “reverse psychology”. The fact that Gore has signed with the Green Bay Packers as a free agent this afternoon may have send his draft value down to the second round. He is the third player from the Bishop’s program to be selected by the Leos in the past two drafts. The Leos picked up a pair of defenders out of the University of Montreal as linebacker Joash Gesse and corner back Hamid Mahmoudi were selected 16th and 20th overall respectively. Two more receivers were drafted in the fourth round as the Lions grabbed Tusculum College’s Nate Binder and St.Francis Xavier’s Akeem Foster with the 24th and 25th selections. The Lions had just a single selection in the fifth round and used it to pick up St. Francis Xavier defensive back Cauchy Muamba and then wrapped the 2010 Canadian Draft by choosing St. Mary’s offensive lineman Adam Baboulas and receiver Matt Chapdelaine, son of Lions offensive coordinator Jacques Chapdelaine.